Facebook's Timeline is coming, whether you like it or not, to Facebook accounts everywhere - including yours. I've been using Timeline for about a month now, and I'm not sure how I feel about it. On the one hand, it's a lot easier to find things -- events, wall posts, etc, because you can now search your Facebook profile by date. On the other hand, it's much easier for other people--friends, strangers, you name it -- to find things, because they can now search your Facebook profile by date. As it turns out, I've posted a lot of things -- not all of which are totally tame and/or work-appropriate -- over the past eight years that I've had Facebook. And now they're all neatly categorized by date. While it's true that you could technically see these posts before the introduction of Timeline, you would have had to do a lot more work. 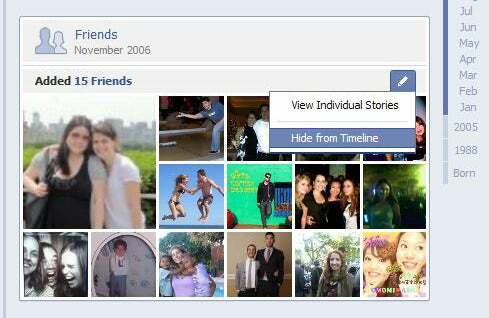 For example, in order to see my posts from 2006, you would have had to go to my Facebook profile, wait for the 20 or so most recent posts to load, and then click "Older posts" about…500 times. Honestly, if someone really wanted to see my posts from 2006 that badly, more power to them. But now they can just see those posts by going to the right side of my profile and hitting 2006 -- and then choosing the month they want to see posts from. This convenient access to my info is little unnerving, in my opinion. So here's how to fix that. 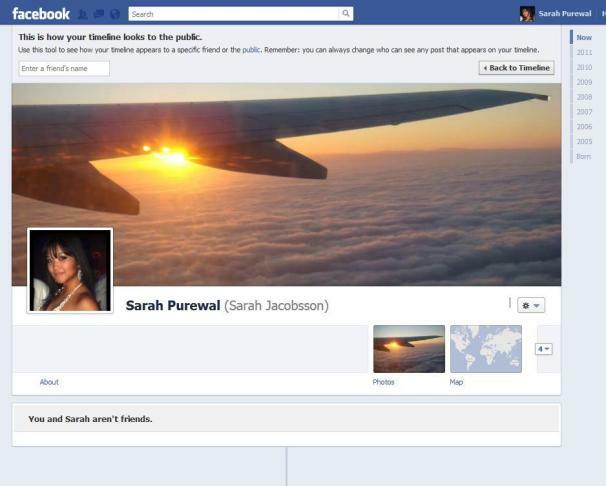 The first step to Facebook privacy is making your profile, or Timeline, private. To do this, go to Privacy Settings > How You Connect and change the settings for "Who can post on your timeline?" and "Who can see posts by others on your timeline?" from "Public" to "Friends." Go to Privacy Settings > How Tags Work and change the settings for "Maximum Timeline Visibility" from "Public" to "Friends." If you're super-intense, you can change those settings to "Custom" and choose "Only Me" -- then you'll be the only one who can see the posts. Finally, limit your past posts -- which may have been made public at the time -- to Friends only. To do this, go to "Limit the Audience for Past Posts" and click "Manage Past Post Visibility," then "Limit Old Posts." This will change all past posts to Friends-only, even if you initially made them public. This is the hard part -- because it takes awhile. Go to your Timeline and look to the right. There will be a list of years -- all of the years that you have been using Facebook and posting items, as well as any years that you or your friends have posted about (for example, years people were born). To pare down catalog of information, you'll have to start from the very beginning. Click on the first year you started using Facebook. You'll see 20 "highlights" from that year, as well as month-by-month breakdowns. First you'll need to click on the upper right corner of each of the "highlight" posts and choose "Hide from Timeline." If you're truly bold, you can choose "Delete Post" instead. Once a post is "hidden" it shouldn't come back to haunt you -- until the next Facebook redesign. If you delete the post, you will be deleting it forever (certain posts, such as friend acceptances, and life events like your birth, can't be deleted). After you hide or delete the "highlight" posts, you'll need to click on each month and hide or delete all of those posts. This will take a long time, depending on how many posts you have, but it's worth it. Occasionally items, such as friend acceptances, will be grouped together and you'll have the option of hiding all of them at once. Continue to hide/delete all of your posts -- month by month, year by year, until you've gotten to 2012. Once you've successfully hidden or deleted all of your Timeline posts, it's time to move onto other people. This is perhaps a more important step than deleting the posts on your Timeline, because you have no control over how other people protect their Facebook privacy (or don't). To remove your posts from someone else's Timeline, go to your Timeline and click "Activity Log." You can now see all of your posts -- comments, likes, and events -- organized by date. To see just your posts, click "All" in the upper right corner and choose "Your Posts"
Anytime you wrote on someone's wall, you'll be able to delete that post -- not hide it, because it's no longer on your Timeline, but delete it so that it won't show up on their Timeline. I know -- at the moment this is a pretty time-consuming process, and there's no way to quicken it up. If you hide a bunch of posts at once, Facebook may ask you if you want to hide all of the posts from that year. I clicked this earlier, however, and now I'm still seeing posts from that year pop up. So it's better to just do it right the first time, and get rid of each post individually, than take the easy way out. If you have a ton of posts from past years that you don't want people to see, you may want to just consider getting rid of your Facebook account and starting from scratch. Otherwise, I suggest manually going through your Timeline over a few days (or weeks), while watching old episodes of 30 Rock, because it can be pretty tedious. And be sure to check out how your Timeline looks by clicking the gear button and then "View As…" to see how your profile appears to strangers and friends.